An exciting combination of theater, music, history and Kung Fu, the lion dance has been a New Years tradition in China for well over a thousand years. Lion dances take place throughout the two-week period of the New Year Festival as the lion, considered to be an auspicious animal, is believed to chase away evil spirits and bring good luck, longevity, happiness and prosperity to the households and businesses they visit. The final grand performance of the lion dance takes place on the fifteenth day of the first lunar month, as the New Year celebrations officially culminate with the Lantern Festival. 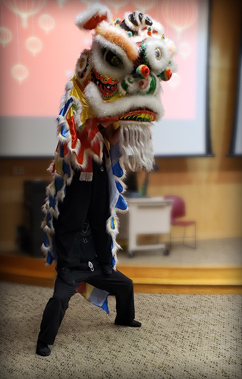 The lion dance may be performed during the year on special occasions such as weddings, parades, birthdays, planting and harvest festivals and the opening of new businesses. The dance is performed by two dancers working closely together as one lion. One dancer carries and activates the head while the other acts as the body or tail. The dancer in the head must act as a skilled puppeteer, moving in quick, powerful feline motions while working to show a variety of life-like lion emotions such as pride, curiosity, playfulness and anger. Attached to the head with a red ribbon is a long piece of bright, multi-colored cloth under which the second dancer must crouch and move as the body and back legs. 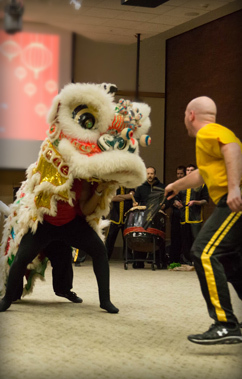 Throughout the dance, the lion is joined by a "Buddha" or Chinese monk who plays the role of comic, acrobatic clown. Dressed in a pink mask with a large smile, he taunts and teases the lion with a fan or a ball. The lion, depending on its mood may play with the Buddha or chase him, biting and kicking the hapless character. the Buddha also offers the chan, helping the dancers find and "eat" their food. The lion dance is accompanied by the rhythms of three instruments - a large drum, cymbals and a gong. Throughout the dance, the musicians play a variety of tempos to match the lion's behaviors and actions. There are two basic types of lion dances - freestyle and the set method. The freestyle form is used when dancers parade through a village, visiting homes and stores during the New Year Celebration. The visit, called the "Pai" brings good luck to residents and businesspeople. Those expecting a visit from the lions hang a head of lettuce or bok choy called the chan or "green" above their door. Inside the chan is the "licee," a red envelope which contains money. To get the gift of the licee, lion dancers often have to overcome physical obstacles and solve puzzles. This dance involves a cycle of carefully choreographed sequences which include an opening with three bows, sleeping/dreaming, awakening/grooming and exiting the cave, playing, searching for food/eating and returning to sleep. The dramatic climax of the Lion Dance is the Choy Ching or "eating of the green." Upon approaching his food, the lion sniffs his prize then eats it while standing motionless. After a rolling crescendo by the drummer, the lion explodes back into activity spitting out the shredded lettuce onto the watching crowd. This is a symbolic act of blessing by the lion as it signifies that there will be abundance for all in the coming year.